We know that gambling affects individuals, families, and the community as a whole. We know that some forms of gambling are more risky than others, for example Video Lottery Terminals (VLT’s), which are actually designed to create dependency. We know that millions of dollars in gambling revenue that could have supported our local economy, leaves our local communities every year. 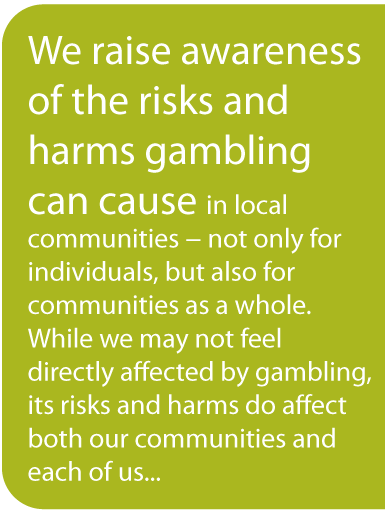 We know it takes a community working together to create an environment where gambling exists but harms are minimized. Please explore KNOW THE FACTS and RESOURCES for more information!